Earlier in the week I found a letter on Elly’s Doorstep… well I suppose it was half way through the letter box. 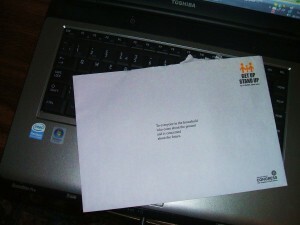 You have won… open the envelope to discover it is a fib, and it is a request to spend money on some rubbish. The Occupier… usually a note telling that the power or water will be off for a few hours on a certain day for what ever reason. The Householder…. Real junk mail selling exactly what you don’t want. Letter addressed to my late husband….. Usually a platinum or gold credit card offer from some bank or other. I once returned one of these saying he would only accept if it was valid for the next world! At first glance I thought someone had left me a present of a puppy or kitten. Then I took a closer look. 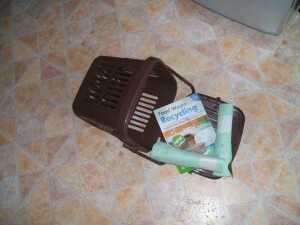 It was a food caddy from our Local Council so that we can recycle food waste. 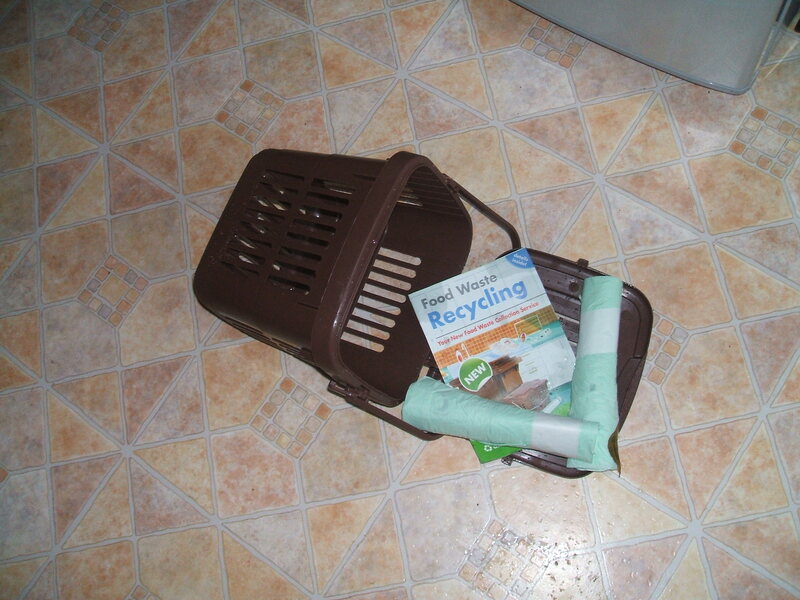 The leaflet informs me that I may put any raw or cooked food in the caddy. Meat & fish – raw or cooked including bones. All dairy products – such as eggs and cheese. Raw & cooked vegetables and fruit. Included are two rolls of corn starch bags and a number to order more! Do people not eat any more? This entry was posted in letters on October 31, 2009 by Grannymar. LBC Members: Ashok, Conrad, Gaelikaa, Helen, Judy, Magpie 11, Maria, Marianna, & Ramana and I are all ready willing and able to turn our thoughts to Weather and Emotions the topic chosen for us this week by Conrad. Wet Wet Wet are a pop band that formed in Clydebank, Scotland during the 1980s. They scored a number of hits in the British charts and around the world. The band comprises Marti Pellow (vocals), Tommy Cunningham (drums, vocals), Graeme Clark (bass, vocals) and Neil Mitchell (keyboards, vocals). A fifth, unofficial member, Graeme Duffin (lead guitar, vocals), has been with them since 1983. OK. OK. I stole this information from Wikipedia since I am not a pop fan and only knew of the band by name. Please do not ask me to name any of their hits as I would not know them. ‘Wet Wet Wet’ in Ireland, perfectly describes our weather for most of the year. The rain comes in more varieties than Heinz Beans! We have clouds so heavy with moisture that they look like fog and the water therein hangs in the air to lazy to fall, so it just soaks in through your clothes and pores until it reaches deep into every bone and joint. This is commonly known as Irish mist, not to be confused with Irish Mist, the coloured stuff that comes in bottles and Americans use to make Irish Coffee (Boy, did that send my emotions and blood pressure sky high [it is a liqueur whiskey to be savoured without addition of coffee and full cream] and even more so when I saw a clip of somebody top the drink with cream from a can! Sure they might as well have used shaving foam. 🙄 ). Next we have what Portia describes in The Merchant of Venice as: ‘It droppeth as the gentle rain from heaven’…. It might be from heaven and it might be gentle, but when it goes on for days on end it feels more like Hell! It might well be perfect for the garden, but is certainly not perfect for my bones. Sure ’tis no wunder so many turn to the demon drink in Ireland! There are ‘April showers’ those short sharp showers, enough to keep down the dust and wash the faces of the flowers in readiness for the sun to peep from behind a cloud. But being Ireland, this phenomena happens whether it is April or any of the other months, and the sun forgets to play the game properly, leaving us dull dark and damp. Then we have winter rain, take your choice… well we don’t actually have any choice about it! It can fall straight and unending from a sky that is dark and menacing looming no higher than a two story house, or driving icy and slanted by the wind until it cuts into your face like a sharp dagger or pounding and bouncing off the ground like bullets from an M16 rifle. This entry was posted in Loose Consortium Blogging on October 30, 2009 by Grannymar. OMG! This house is quiet!!! Elly has now resigned from nursing duties and returned to her Love Nest in Dublin. I was down there from Sunday to Wednesday afternoon. It worked well for several reasons… she had a couple of training sessions on Tuesday and Wednesday morning, it gave me the opportunity to try a long journey in the car with one stop for coffee and a walk before getting back in for the final hour. I was a little stiff when we arrived, but still had no pain. The area around Elly’s house is very flat and all roads and pavements are new (no pot holes!) I managed plenty of walking without the crutches and I also practised walking up and down her stairs PROPERLY. Yesterday I went for my review at the Hospital. I walked in sans crutches and everyone was really pleased and amazed with my progress. I now have permission to start driving my car once more. Since it has a manual stick-shift, I need to practice a few exercises on the pedals first. The plan was to take the car out of the garage when we came home but the rain had other ideas. It is also Mid-Term holiday for the schools so very wet weather, hyper kids and harassed mothers are enough to put off the first run in the car for a day or two. Next week. I will try it next week! Everyone seems amazed at how quickly I got back on my feet. I think that knowing Elly had only a limited time available to help me, was the reason. If there was somebody calling everyday to help, then the need to push forward and try harder would not have been there. So Great credit must go to Nurse Hitler Elly, George, Niamh, Darragh and Lesley for the part you played in my recovery. So what restrictions are still in place? I am not allowed to vacuum for another three weeks, never to cross my knees again or do any silly twisting. This entry was posted in Health on October 30, 2009 by Grannymar. With thanks to my dear friend ‘Anony’ – Mouse for this one! This entry was posted in humour on October 29, 2009 by Grannymar. 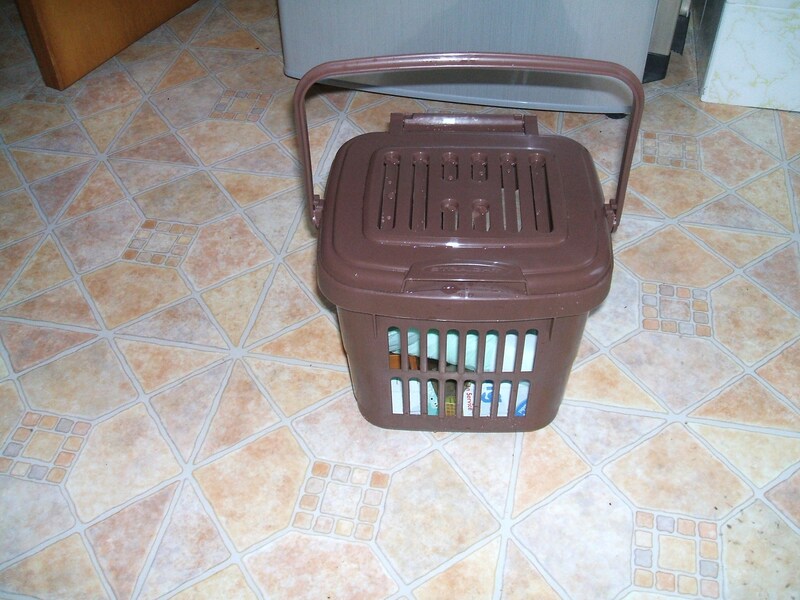 Today I share with you the final miniature container that I made using the items from the sea. A piece of coral that looked like lace caught my eye this time. The coral looked delicate so I wanted the finished item to reflect this. I remember reading an article about Miser’s purses and it fascinated me at the time. If I remember correctly the original shape of a Miser’s purse was in the form of a figure 8. All the coins were inserted in the centre and slid towards either end, usually silver to one end and gold to the other. The purse was closed at the centre with rings. The name was due to the fact that removing the coins was difficult. By the late 1890’s, Miser’s purses were available in a great variety of shapes. 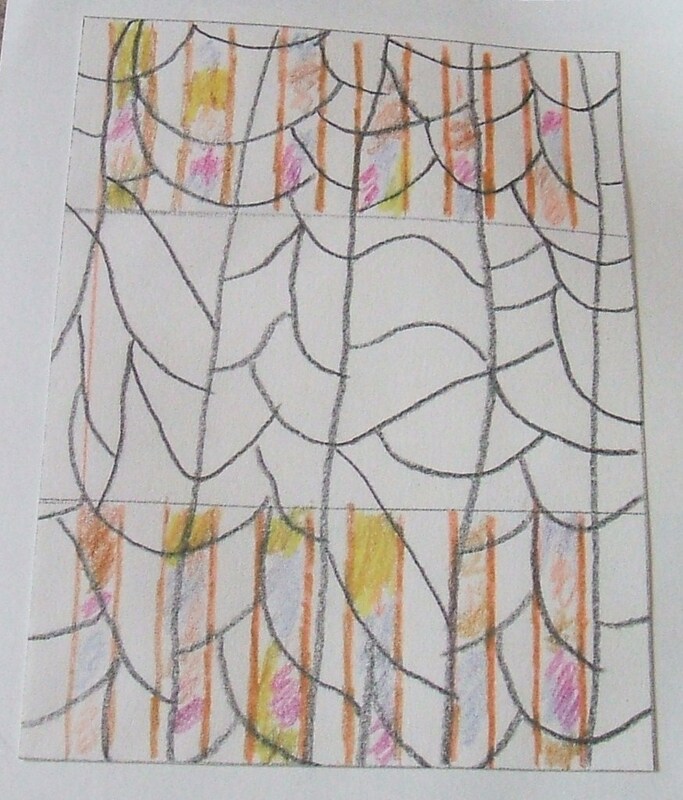 My idea was born….. A Miser’s purse to reflect the pattern of the coral. 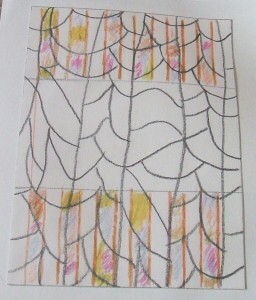 The next stage was to sketch the coral pattern and play about with it. I liked the the lines of the sketch on the right. 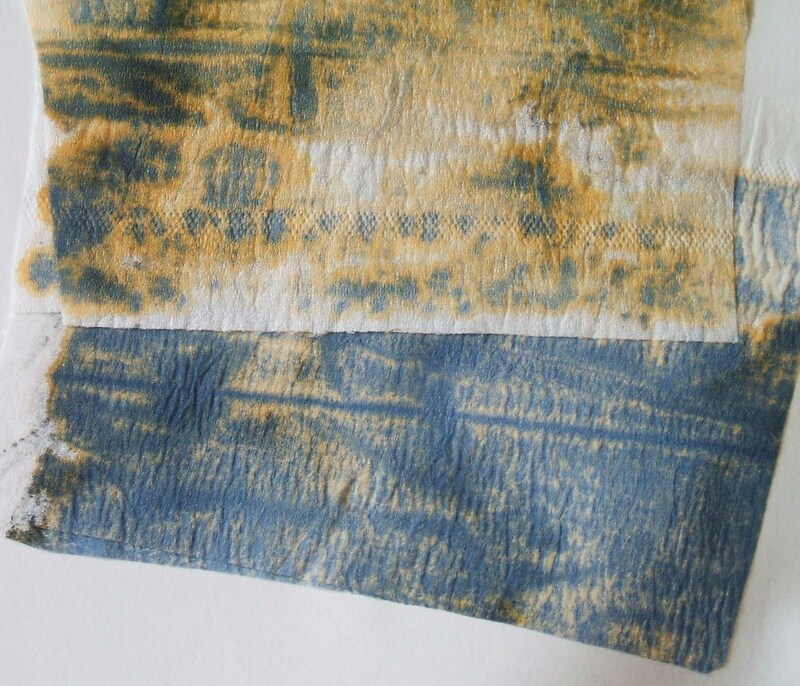 Last week I talked about using a satin fabric coloured with an ink tea. The tissues above were all part of that experiment. 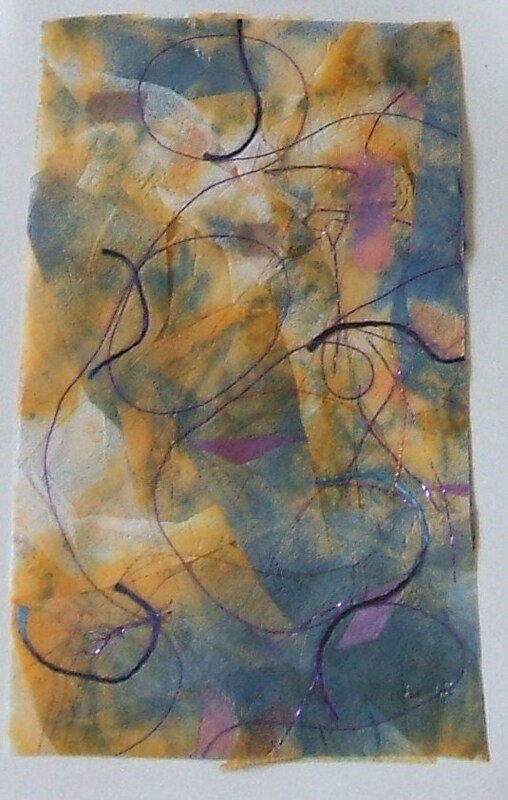 A large piece of felt was soaked in black Quink ink to take on the colour. It was then wrapped in layers of different fabrics and tissue. Each absorbed the ink at a different rate. Again it was left to dry naturally over a couple of days. The tissues above were used as outer layers to soak up the excess moisture. The blue tissue was closer to the ink and the ones furthest away gave a very interesting effect. There will be more of this in a future project. I dislike waste so sought a way to incorporate the colourful tissue in my projects. Firstly I needed to decide on my design shape. 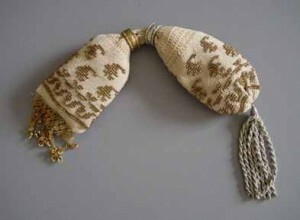 A single drawstring bag with small trim. Once the design was sorted it was down to the actual making. 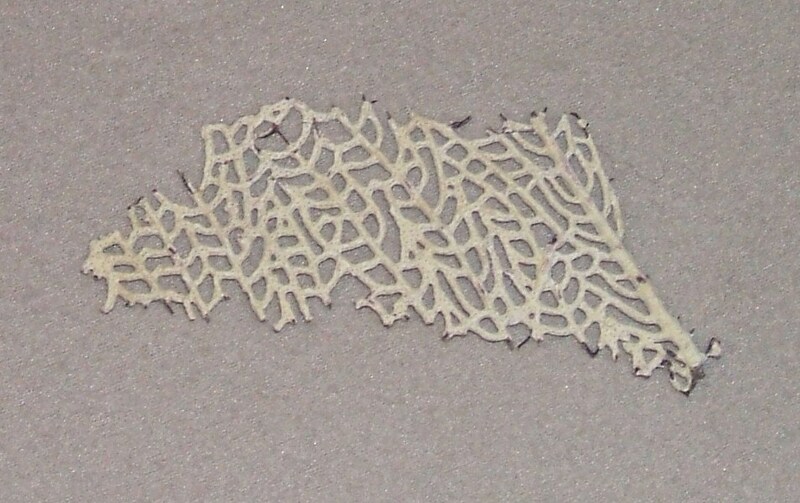 This sample is made from some of the tissue paper described above. Who would ever think that the rich egg yolk yellow would come from black ink…. 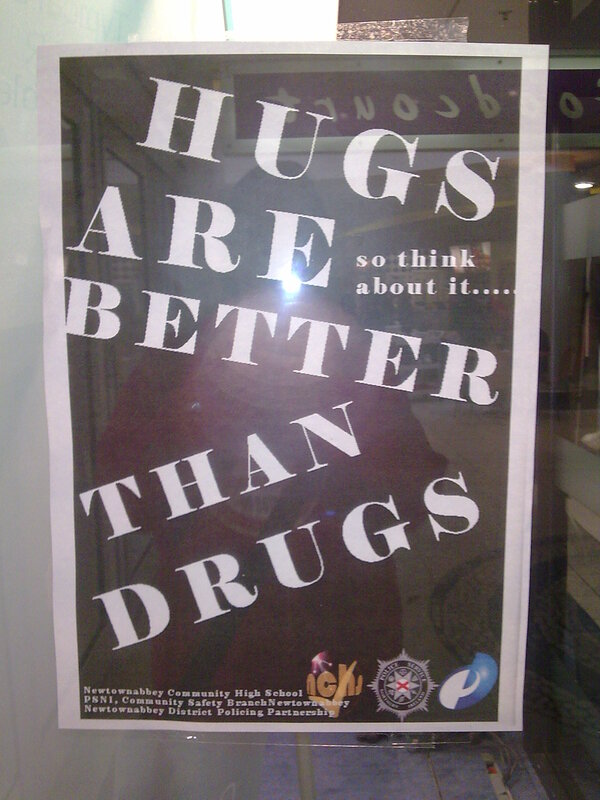 but it did. Tissue was randomly torn and places on a backing sheet of fine muslin. It was further embellished with scraps of coloured organdie and threads of different texture and thickness. I then trapped it with a layer of clear Contact Film to hold everything in place. 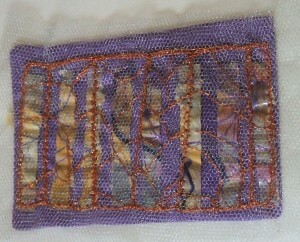 I wanted to use this new ‘fabric’ in narrow strips while giving the purse an overall soft feel. 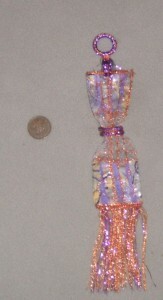 A close up sample of how I wanted the purse to look. 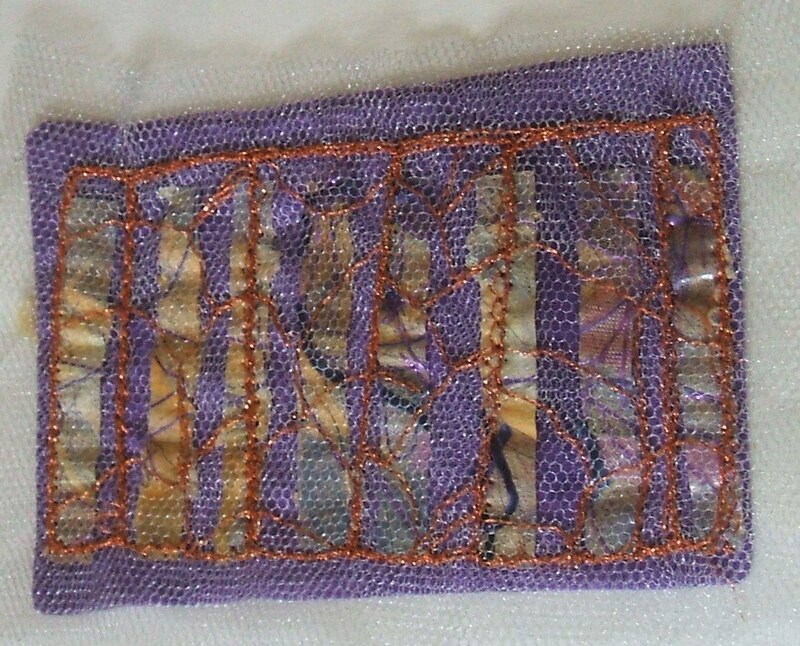 The backing layer was cotton with fine strips of my tissue/plastic fabric overlaid with a double layer of tulle before overstitching in a metallic copper thread to form the pattern of the coral. For the finished item I bound three bone rings, one to slip over a little finger to aid carrying the purse and the other pair to act as closures to guard the coins. I finished the purse with a fringe of the threads used in the project. Did you recognise the coin? It is not a very clear picture, but the coin is actually a farthing. The quality of my photos are not good they were all taken on one day pre-surgery so that I would have something to work on during my weeks of ‘captivity’. This post was written this morning at Elly’s house in Dublin before we head up the road for home, and the farthing is at home so at this point I am unable to confirm the date on it. So with a farthing in my miser’s purse…. I will always have money. 😉 Don’t tell the Toyboys! 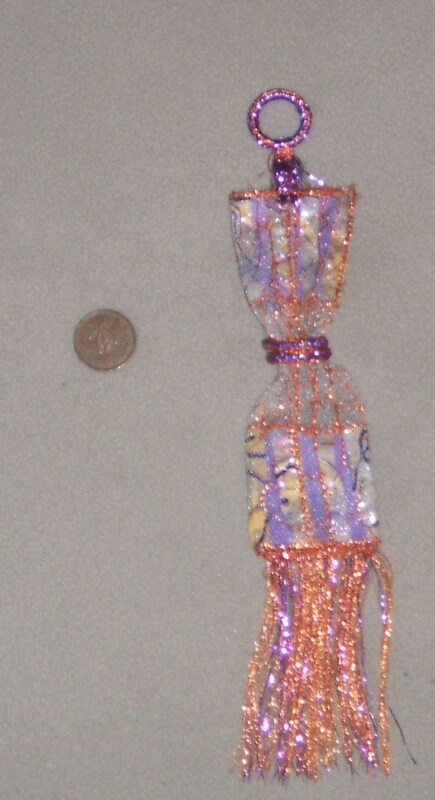 This entry was posted in Crafts on October 28, 2009 by Grannymar. This entry was posted in Uncategorized on October 27, 2009 by Grannymar. Today I will be busy….. again! This entry was posted in Uncategorized on October 25, 2009 by Grannymar. I saw this in the window of a Bank when we were out today. Sorry for the kickback with the flash. it was taken with my mobile phone. This entry was posted in Uncategorized on October 24, 2009 by Grannymar. LBC Members: Ashok (will return shortly), Conrad, Gaelikaa, Helen, Judy, Magpie 11, Maria, Marianna, & Ramana are all Heroes in my eyes. I join along with them as we turn our thoughts to Heroes, the topic chosen for us this week by Magpie 11. 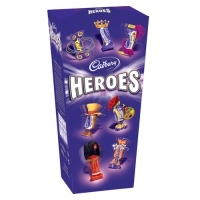 My first thoughts were to take a box of sweets and find a Hero to match each variety. This would involve thoughtful tasting while considering the talents and gifts of family and friends. The fact that all but one were milk chocolate, something that I must refrain from eating, I changed direction and went in search of inspiration somewhere else. Mary my father’s eldest sister is the person who fostered my love of a needle. She taught me to crochet and to read a sewing pattern properly. I had lessons on her old treadle sewing machine and she helped me to make a dress for the very first time. To this day I still see it in my minds eye. Being the early sixties it was A-Line, sleeveless, fully lined and had two fringed patch pockets on the front. 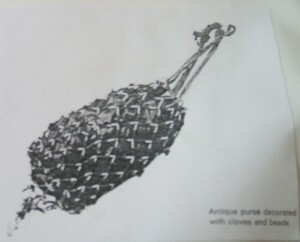 Auntie Mary was a teacher and had a love for her craft and passed on her knowledge with love and gentle dedication. I have never forgotten anything that she taught me. A young lady full of hopes and dreams in the photo above taken in 1919, was all too soon to taste sorrow and sadness. 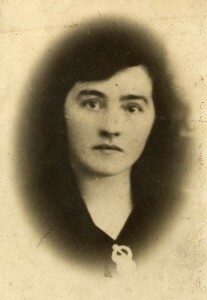 Having trained as a teacher she then married at 24 and within four years was left a widow with two young children. She once again embraced the world of the classroom, teaching for many years in a two teacher school in the heart of the country. Her early years of widowhood were difficult with little money for the necessities never mind luxuries. When her family moved to Dublin and College she joined them finding work in an inner city school. It was a very different environment from the one she had left. Most of the young ladies were the daughters of street traders and their aim in life was to leave school on the day they reached fourteen, it was the legal age to leave school at that time. Back then it was also the legal age for a young girl to marry. Marriage and ‘Babbies’ (babies) were all those girls wanted. In fact it was not unknown for a young girl to arrive in school with a baby in her arms. 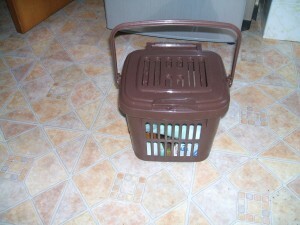 On asking the for the reason, my aunt was informed “Me mammy had to go to the market, and I was left to mind the babbie”. My aunt turned these occasions into lessons on Life skills! Daddy who was only eight when the photo above was taken, was very helpful to his sister over the years. Once in Dublin she became a regular visitor to our home and table. She regularly sought his advice. She eventually moved to a school a few miles from us and bought a house in the locality of the school. She loved the place and the children and worked on for many years past retirement. Her class in those years was of 40 children; and I remember at one time another teacher was on sick leave for several weeks, My aunt took care and taught both classes (80 children) for the duration! What teacher would do that nowadays? I loved to visit her house, yes, me who hated school! She had school projects everywhere and patiently showed them to me. Once she was on the topic of school she forgot everything else, food seemed unnecessary, as she worked on items for display to her pupils. I loved how her long elegant fingers seemed to caress fabrics for our sewing. With each visit there was something new to learn, and she was generous with her knowledge. I wished that she could have been my teacher. She always adorned her dress with a brightly coloured scarf or a sparkly brooch. One day I remarked on the fact. She told me the reasoning behind it. They were a tactic to hold the children’s attention. If she felt that some of the children were drifting away from the subject, she simply moved across the room and the bright colours in the scarf or the light playing on the brooch soon brought the focus back to her. At her funeral it was wonderful to see so many of her past pupils turn out to pay their respects. Auntie Mary was a Hero for all those children too! This entry was posted in Loose Consortium Blogging, memories on October 23, 2009 by Grannymar.